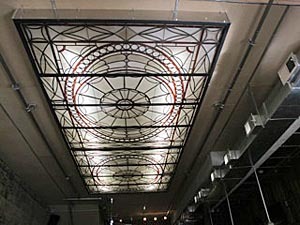 This stained glass is from the former Merchant’s National Bank on Mattison Avenue in Asbury Park. The Fasano family jokingly calls it “the complex” but as even William Shakespeare said many a truth is said in jest. The city’s newest restaurant, Capitoline, owned by Asbury Park developer Patrick Fasano will be opening soon on Cookman Avenue in the heart of the city’s downtown. This ambitious undertaking by Fasano includes two other diverse restaurants, each fronting on different streets, before heading downstairs to The Basement for some pool, bar games, food and drink. All of this can be enjoyed without setting foot outside. Fasano’s current restaurant The Bond Street Bar and Grill, located on Bond Street, will have a connection to Capitoline through a doorway that leads to a hallway connecting the two establishments. La Loteria will serve Mexican street food such as tacos and burritos. After coming to the end of the hall from The Bond Street Bar, restaurant goers can make a left turn and head into La Loteria, a Mexican restaurant whose front door sits on Mattison Avenue. All three restaurants will have a combined capacity of about 300 patrons. Although vastly different, all three restaurants feature a united theme, good, familiar comfort food at reasonable prices. Capitoline, said Anna Fasano, Patrick’s daughter, will be like eating in your Italian grandmother’s kitchen. “Meatballs, pasta dishes and we are trying to stay with the same price points,” she said, which means affordable. La Loteria, which is named after a Mexican game played since that country’s colonial period, will feature Mexican street food, called Taqueria featuring tacos and burritos. “It will be a la carte, tacos will be $3 to $4,” she said. 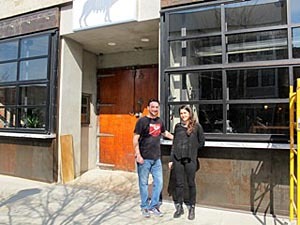 Charlie Interrante, manager of the new restaurants, and Anna Fasano who helped design them in Asbury Park. General Manager, Charlie Interrante, has 20 years in the restaurant business, including the Bond Street Bar and Grill. “We are all Sicilian,” Anna said smiling. But the food is not the only fascinating thing about this project. What makes all three restaurants interesting is the design along with the use of local materials and repurposed materials. Asbury Park residents seeking a bit of nostalgia during a night on the town will find it at Capitoline. Local decor items include a chandelier hanging over the stairway to the basement which is made from a pin setter salvaged from Asbury Lanes. In The Basement there is a washing machine door taken from a machine from Sam Wha’s Laundry, formerly located at Sewell Avenue and Bond Street. The washing machine door is the top half of a door leading from the bar to the kitchen. In another example of utilitarianism the round glass door of the washing machine door opens, allowing servers to pass food through to the bar. Anna, an artist and a sculptor, designed the two new restaurants and helped her father pick out materials. “We found locally sourced materials,” Anna said, adding that the base of the bars are all made from concrete forms while the bar tops are wood taken from defunct businesses. Other sources of materials include the former music school located on Lake Avenue which provided the floor beams for the restaurant and a large stained glass piece acquired from the old Merchants National Bank on Mattison Avenue, which since closing has housed a series of eateries. Fasano said his carpenters personally made the furnishings inside the restaurants. “Everything is handmade, the bar stools…it’s all reclaimed building material from the area,” he said. The unique decor, however, is evident before customers even set foot inside. The antique, large wooden front doors of Capitoline were acquired from Shore Point Distributors in Freehold and are affixed with brass metal plates with the name Jamesons imprinted on them. 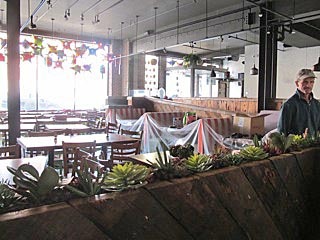 Both new restaurants are projected to have soft openings in the beginning of April. Posted in Uncategorized and tagged Asbury Park, Joanne L. Papaianni.